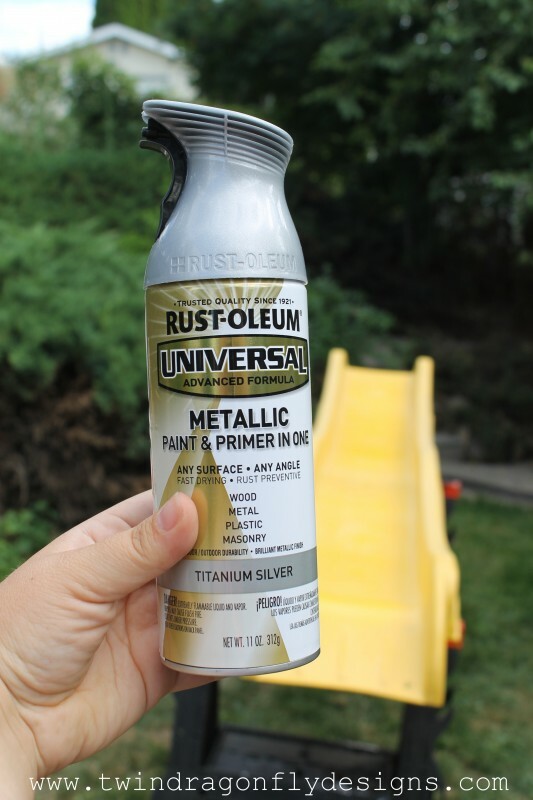 If you have ever thought about painting your old slide then this is the post for you. We just finished (almost – is anything ever truly 100% done?) landscaping our backyard and this project was one of the final touches. I love incorporating things for the kiddos in our decor. Here’s how to make those colorful, loud, fun, bright plastic kid accessories blend into your design. First off you absolutely NEED to use this Universal Paint and Primer in One from Rustoleum. It covers any surface, from any angle and was perfect for this slide project. I used Metallic Titanium Silver and I love the matte finish that it gave our slide. The comfort grip nozzle and easy any direction spray was a must have for this project. I used a total of six cans of spray paint on our 8 foot slide. Each coat of paint dried very quickly and it took just over an hour to paint the entire slide. I used three coats of paint on this project which I hope will be strong enough to resist significant wear or fading from multiple use. The kids have been using it for a few weeks now with no scratches or visible wear to the paint. I even added this Vinyl Slide Decal for fun! I will update you with how the paint lasts and any wear that we have throughout the summer. 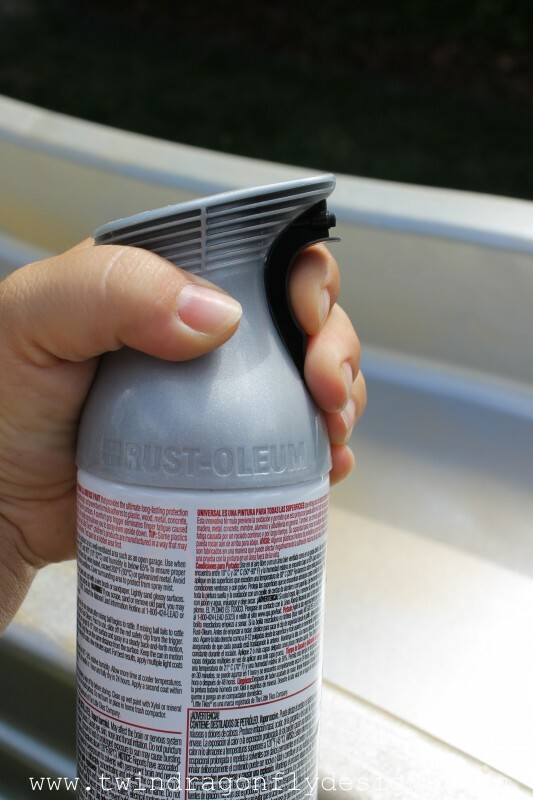 I was so excited when I met the folks from Rustoleum at SNAP because I knew that I had the perfect project for them! They sent me a box of spray paint to test out on this project but all opinions are, as always, 100% my own. I am super pleased with how long the paint has lasted on this slide! I put vinyl words on it which have started to peel off obviously but the paint has held up exceptionally well in the three years since I painted it. The only chipped paint is where water tends to pool on the slide at the bottom. 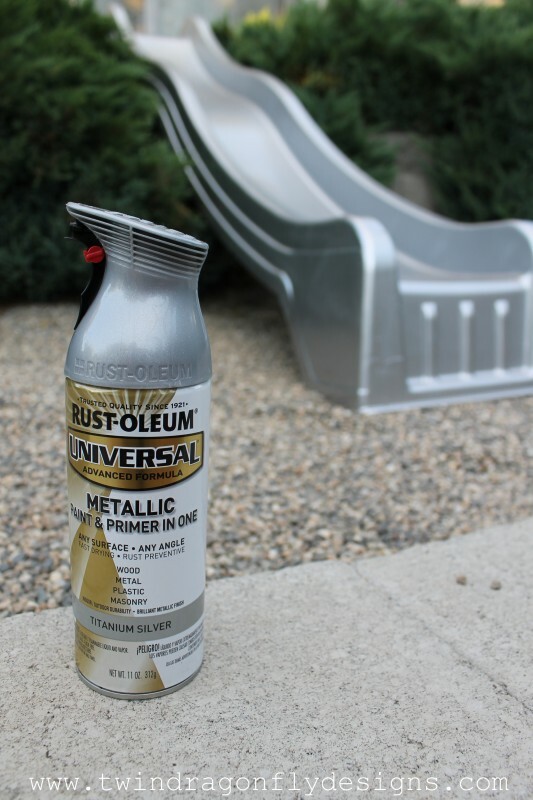 I love that you painted the slide silver. I totally want to do this. How is the paint holding up? Does it transfer onto the kids’ clothes? We live in Louisiana, where it is quite humid and we get a lot of rain. Its been two summers and its holding up awesome!! Just a few scratches where the kids come off the slide. I am really happy with this paint! Did painting the slide effect the speed of the kids going down? 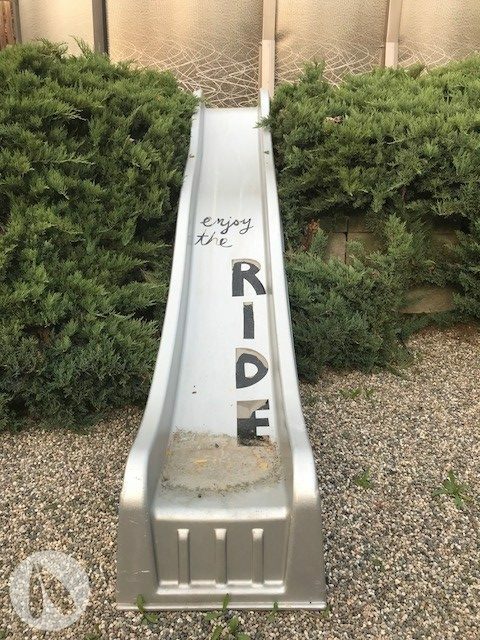 I’m wondering if the paint increased the surface friction between kid and slide. We are in the process of building our kids a play fort and I came across your blog when reseaching how to paint a slide. I found one cheap on Craigslist and you give me such hope! Quick question…before painting, did you have to do any prep work? Like sanding it? Did you find painting ut made it less slick? So the paint has flaked off!? 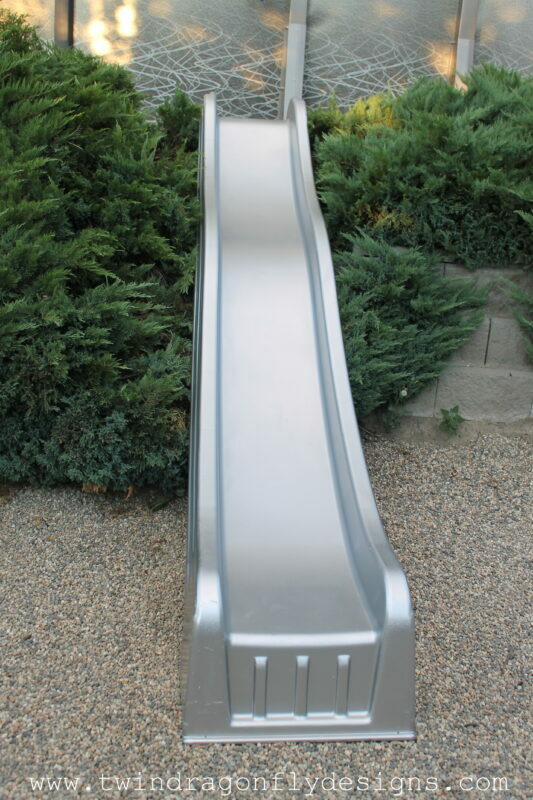 Have any recent pictures of the slide? Are you able to post an update yet? Thanks in advance. 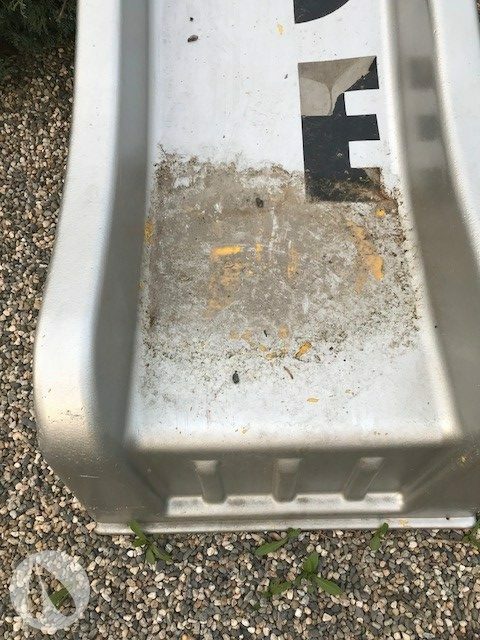 Update on slide? 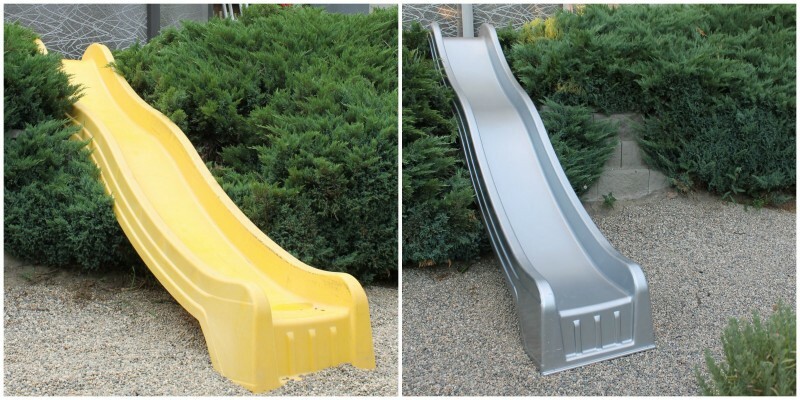 Looking to paint our yellow play set Slide? Does the paint come off on clothes at all? Thank you!! Update now posted 🙂 The paint has not come off on clothes. Thank you for this post! This was exactly what I was looking for and all my remaining questions were in the comment section already! So excited to make the yucky slide in a more feminine color! Blessings to you!